For someone who's absolutely afraid of haunted houses, I don't know what came over me to organize a trip to Screemers with a few friends from work. There were six attractions in all including: The Haunted House, The Castle Of Doom, The Black Hole, The Maniac Maze, The Asylum, and Terror In 3-D. I get scared extrememly easily and I'm no fan of walking in the dark. As you can imagine, walking through haunted houses is not my idea of fun. Fortunately, I had a few "human shields" with me in the form of CC, CW, DL...as for WS, DN, and WS's friend A, well not so much. With WS prompting the ghouls and wandering blood-soaked mutilated beings with encouragements of "get her!" "Good work! ", I just wanted to smack him. We went into the Asylum first and as soon as CC, CW, and I went in, they closed the door behind us. It didn't take long before I freaked out and screamed at the top of lungs. It was loud enough that even the guys could hear me outside! I thought that some of the rooms with cut up bodies would be cheesy but most turned out quite scary. The hanging severed heads and dangling dead bodies wrapped with plastic were particularly hair-raising. Even though I know very well that they're fake, the settings do play up against some of my fears and messed with my imagination. In the Blackhole, we felt our ways around in total darkness but there were creatures hiding in places and jumped out to say random "scary" words at us. It was hilarious when one of them hissed "cybersex!" and WS replied with "that would be nice". So obviously, some words don't quite illicit as much fear as others. Of the six attractions, the only downer was the Terror in 3-D and Maniac Maze. All in all, it was a fun evening and I lost my voice at the end of the night. Thanks guys! I'll try harder to convince more girls to come if we ever go again. 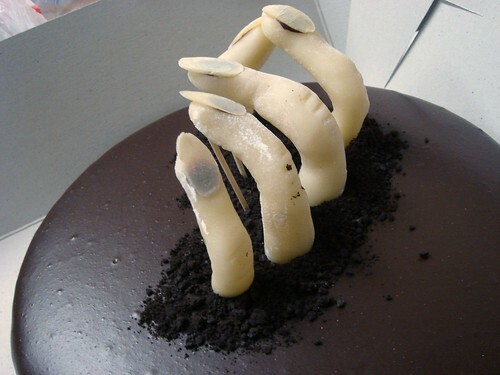 I remember reading somewhere that when pastry chefs' creativity turns awry, things can get ugly very quickly. I guess I had one of those episodes this weekend when I decided to turn a Grand Marnier Flourless Chocolate Cake from gorgeous to ghastly in honour of Halloween. The cake is adapted from the Grandmother's Creamy Chocolate Cake in Dorie Greenspan's Paris Sweets. This is actually a very delicious and rich tasting cake with a strong Grand Marnier kick. Even the shiny chocolate glaze is flavoured with the same liqueur. Want more cringe-inducing dessert ideas? How to make an irresistable dessert more appealing? Make a miniature version! I'm thrilled about this month's theme, Little Bits Of Delight, for Sugar High Friday. In fact, this topic is quite familiar for me as it is something that I occasionally do at my workplace when they require a sweet table for group dinners. Converting a regular recipe to miniature portion is actually quite easy most of the time. If it doesn't require any baking, the lazy way to go is to pick small serving vessels and adjust the garnish to scale accordingly. I've chosen to make a caramelized pineapple mousse as an example of this approach. However, for something that requires baking, it is best to experiment with the baking time and keep a close watch on the oven because things may bake up much sooner than expected. One of my favourite examples is mini cherry clafoutis. The best part is of course being able to taste the finish product much sooner with such a short baking time! Heat a heavy frying pan on high heat. Toss pineapple in sugar. Brown in pan along with star anise until the pineapples are caramelized. Add rum to pan and cook until liquid is reduced. Remove from heat and cool. To make the pate a bombe base, cook the water and sugar to the hard ball stage. In the mean time, whisk the egg yolks with a electric hand mixer until pale. Once the syrup is ready, continue mixing the yolks on high speed while drizzling in the syrup at the same time. The pate a bombe should increase in volume and quite creamy. Put the mixing bowl over a pan of simmering water and keep mixing until the base becomes thick and glossy. Remove bowl from pan of water and continue whisking until it cools to room temperature. To make Italian meringue: Put sugar, glucose, and water in a clean pan and cook to hard ball stage. In the mean time, whisk the whites with an electric hand mixer until foamy. Drizzle in the syrup and keep mixing until the meringue turns glossy soft peak. Continue mixing until the meringue cools to room temperature. When the pineapple is cool, throw away the star anise and puree the fruit. Fold the pineapple puree into the meringue gently and then fold in the pate a bombe. Whip the cream to soft peak and fold cream into fruit mixture. Spoon into wide mouth shot glasses and chill until lightly firm. 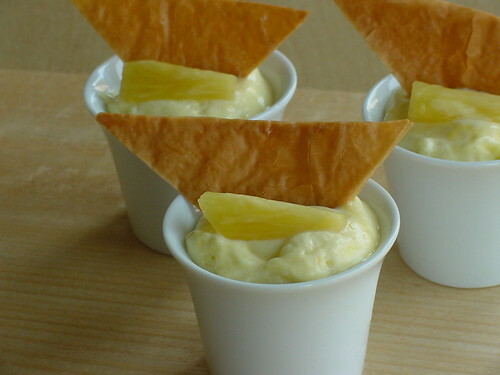 Garnish with triangles of caramelized phyllo pastry and fresh pineapples. a batch of your favourite pate sablee (sweet tart dough). I like to use Pierre Herme's recipe from Chocolate Desserts By Pierre Herme. The addition of ground almond goes very well with the cherries in this recipe. Line mini tart tins with the dough. Partially bake the tart shell according to your recipe's instruction. A trick to weigh down the tart shell is to put a paper muffin liner on top of the dough and spoon rice inside the liner. Preheat oven to 400F. Put the tart shells (still in the tins) on a large baking sheet. In a large measuring cup with a spout, whisk the eggs until they are blended. Whisk in the sugar, creme fraiche, and vanilla very gently until mixture is homogenous. 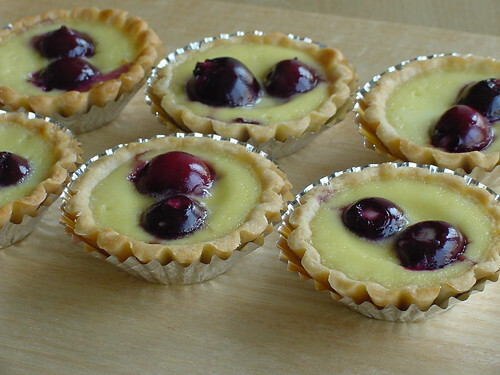 Place two cherries in every tart shell and top each tart shell with custard mixture. Bake for about 15 minutes or until the custard is set in the centre. Unmold as soon as the tart is cool enough to handle. I like to eat them while they're still warm! I was excited to find a newly openned burrito place in the airport area so I went over for dinner before going to skating practice this evening. I'm a fan of Burrito Boyz in Toronto so I had high hopes that Mucho Burrito can provide me my burrito fix in the suburbs. I had a carnitas burrito made with flour tortilla, cilantro lime rice, brown beans, mild tomato salsa, medium tomatillo salsa, cheese, sour cream, and guacamole. As soon as I placed my order, the guy behind the counter put a tortilla in a sandwich press to warm it up. At that moment, I knew I came to the wrong place. All the ingredients were sitting in containers in a hot table. He assembled my burrito and shaped it into a lumpy square before giving it a good squeeze to make sure nothing falls out. Just like that, no reheating, no grilling (oh how I miss the crunchy grilled exterior of those from Burrito Boyz). Taste-wise, it was really rather blah. Aside from the lukewarm filling, the meat was really dry, the beans were whole beans (I was hoping for mashed refried beans), and the sauce didn't really meld with the filling. I felt like I wasted precious calories after finishing this "wrap sandwich". According to the website, this is actually the first of many franchises to come. I'll be sure to avoid it next time I see one around town. T and I went to the newly-opened Ten Ren's Tea Time for dinner last night. This is probably one of its new concept store because this new Richmond Hill branch is huge and very beautifully decorated. There was a glass divider which separated the loose-leaf tea retail counter. With an extra tall ceiling, the whole space looked spacious and comfortable. 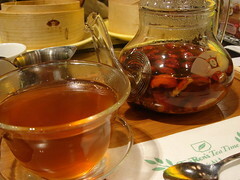 However, most importantly, there is an extensive menu of tea-flavour dishes, both savory and sweet. I couldn't wait to try. The best deals are the set menus with prices between $12.99 to $19.99. There are choices of soup, main course, side dish, dessert, and of course drinks such as bubble tea, cha-puccino, and fresh fruit-infused tea. Considering that ordering the drink a la carte would already set me back $6, the set menu is a steal. T started with a garden salad and a seaweed pork meatball soup. 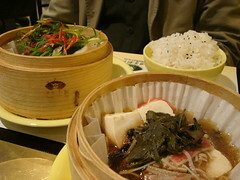 His main course was steamed fish filet with a side of steamed tofu, both of which infused with different types of tea. He said that they were quite nice although the tea flavour was very subtle. I wasn't too hungry so I enjoyed a bowl of noodle soup with tea-flavoured minced pork, pork meatball, shrimp, and bean sprouts. Again, the tea flavour was weak but it hit the spot on this chilly evening. T had a dessert of frozen green tea orange mousse that looked like refrigerator cake to me. He enjoyed the dessert. The star of the meal was definitely the drinks. Hot drinks are served on a bamboo tray holding a teapot, teacup, saucer, teaspoon, and a little pitcher of syrup. T had apple tea with chunks of apples floating around in the amber liquid. I ordered a jujube, dried longan, and lotus seed sweet tea. All three ingredients are naturally sweet on their own and they make a classical Chinese sweet tea combination. After all the tea was gone, I even ate all the dried fruit. It was a tea and dessert in one for me! The service at Ten Ren's Tea Time can be a little unorganized at times but this is a place meant for lingering. I can see myself returning for a light meal or drinks quite often. Note that since this is a teahouse, it stays open late. This is one very attractive alternative for late-night dining in the suburb. 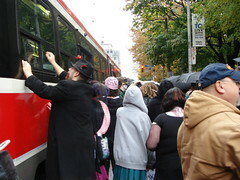 I read in the paper this morning that the annual Toronto Zombiewalk was taking place today. Of course I wasn't going to miss this great event. 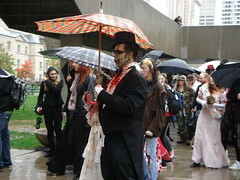 I quickly got out the door and made my way over to Nathan Phillips Square where a large group of zombies congregated. It was fun to see how some people were still putting in final touches to their zombie persona with a dab of blood here and a brush of white makeup there. In addition to all the undead, this parade also attracted a huge crowd of photographers and curious passerbys. When the parade finally began, it literally stopped traffic despite being escorted by police officers. As soon as the zombies spotted a streetcar, there was no stopping them from banging on the windows and demanding for brains. "What do we want?" "BRAINS!" It was one of the most surreal thing that I've seen in a while. The hundred-plus strong crowd was moving slow as expected. You can't possibly expect groaning, limb-dragging zombies to run, can you? I crossed over to the other side of the street and ran ahead of the parade. I found a good spot at an intersection and caught some great footage of the parade. It was so much fun...I'll join in the parade next year for sure! My previous two dinners at Susur had both been underwhelming to say the least. When the adjacent tapas-style eatery Lee opened, I was wary to give it a try. Years and months have gone by without any incentive for me to try Lee until last Friday. After KS's birthday party, I wanted to grab a bite to eat before going to bed early for training early next morning. The newly opened KiWe looked interesting with the bar area jammed with good looking people. Unfortunately, the restaurant was fully booked and the kitchen could not take any more orders from the bar either. I walked out of the place a little disappointed but it wasn't entirely unexpected. A few doors down, it was a choice between Thuet and Lee. I would have gone to Thuet anytime but I decided that I needed a lighter meal instead. The best thing about dining solo is that I can usually seated at a restaurant without a reservation. I was quickly seated at one end of the bar and entertained myself with some people watching. I'm already familiar with the whole small-dishes-meant-to-be-shared and plates-arriving-at-no-specific-order deal of these tapas-style restaurants. But to me, the menu reads more like a build-your-own tasting menu which is just fine. The Spiced lamb chops with Chili Mint and Pineapple, Fried Banana arrived first. The lamb chops were very tender and pink. The tender meat was very delicious until I bit into globs of fat. I understand that flavour and tenderness come from the fat but I would expect a chop to be better trimed. The accompaniments of this dish was what really shine though. The heat from the chili against the cool mint made for one lively sauce that reminded me of Indian food. The fried banana was sweet, mellow, and a surprisingly good sidekick for the lamb. Next came the Thai baked lentil with Spinach, Paneer, Coconut, and Polenta. This dish arrived in a piping hot ramekin smelling lovely, just like the familiar smell at Linda and Salad King. However, the taste was just rather wimpy compared to the smell which suggested loads of fresh herbs and spices. I personally love polenta but the rectangle piece of polenta sitting on top of the baked lentil was more like a wet sponge. It actually diluted the already weak flavour of this dish. The last dish that arrived was Slow Cooked Cuttlefish Mediterraean-Style with Sundried Tomato and Potatoes. It was a mixture of cuttlefish and mini octopus cooked to soft and tender. The sauce was tart and flavourful from fresh and sundried tomato. The cuttlefish didn't really absorb the flavour from the sauce but it was quite good when I ate with each pieces coated heavily with the sauce. This "stew" was hearty and the portion was big compared to the other two dishes. I would say this dish is indeed truly meant for sharing. I can't say the same about the lamb chops. Service-wise, the waitstaff was friendly and well-organized. However, one little thing bothered me repeatedly throughout the meal. The busboy kept on bringing out the dishes and set them between me and the guy on my left as if he wasn't certain that I was dining by myself. It was quite awkward that I had to "claim" my dishes everytime. I know it can be hard to believe, but there are single girls who enjoy dining alone on a Friday evening! Over all, for a $50 meal including tax, the portion was generous and there were some solid quality. However, there are many choices around the city for tapas-style dining and the Asian-inspired modern cooking at Lee doesn't excite me as much as my other favourites such as Mirabelle and Torito. Lee is a very hip space packed with people who want to be seen. I'm not sure I'll come back anytime soon. It's almost that time of the year for me to plan for Christmas cookies. As usual, I'm almost as thrill about the prospect of preparing dozens after dozens of delicious cookies as packaging them beautifully and creatively. I was sitting at my desk today and a brilliant idea surfaced out of nowhere. Since many of the recipients are also regular readers at Dessert By Candy, I think it's best that I keep this a secret. there will be 25 cookies per gift. No more, no less. I need lots of little boxes or little bags. some cookies will need to stay fresh for longer period of time than others. I need to have everything ready in November. Can you guess what I'm going do? Since I met so many new friends this year, my list of recipients has also grown since last year. Preparing all these gifts will take time and planning but it is also most satisfying to see the smile on my friends' faces. I'm still brainstorming for ideas of what to make. I think I have spices on my mind though. 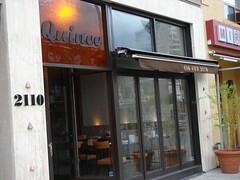 I've been debating if I should blog about my visit to the newly openned Quince. I went there for dinner last Saturday, less than a week since its opening night. It seems a little unfair to "review" a restaurant when it is still in the process of getting up and running. However, since my experience was quite positive, I don't think I can do any harm. Since it was a bit of an unplanned visit, I made a reservation only an hour before to have dinner at their bar area as the restaurant was fully booked. The restaurant has a very modern decor that is warm and welcoming. The dining room is quite large with additional seating/private room downstairs. From my seat at the bar, I could watch the open kitchen through large glass windows. It was a very nice touch especially for a solo diner like me. I decided to go all out and enjoyed a three-course dinner. The menu reflects the season well with lots of emphasis on game, oven roasting, braising...a comfort food vibe for fall and winter. 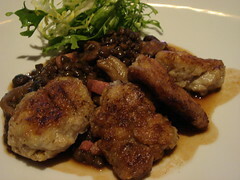 My appetizer was oven roasted sweetbread and lentil du Puy with double smoked bacon and rosemary. The sweetbread was very caramelized with a slighly crunchy exterior. It was delicate and delicious. The lentil had a much more robust flavour strengthened by the bacon. I love this accompaniment but felt that it overpowered the subtlety of sweetbread as subsequent bites of the sweetbread turned rather bland. My main course was a medallions of roasted marinated rabbit in olive jus served with braised fennel. If you love the flavour of anise, this dish is for you. The anise flavour was echoed from the fennel to the jus. I found the rabbit to be just a tad on the dry side but the fennel was very good when soaked with the olive jus. 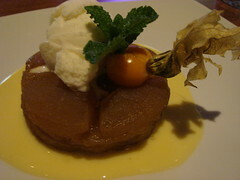 For dessert, I ate a tarte tatin served with housemade lemon sour ice-cream. The caramel and the apples were absolutely delicious because of the complexity of the caramel. It was deep with a slight hint of bitterness and the apples soaked up all those flavour. The lemon sour ice-cream was smooth, not very rich, very refreshing in its own right. It was a nice departure from the usual vanilla ice-cream pairing. Unfortunately, the puff pastry was nowhere near what pastry suppose to be. It was limp and doughy. All in all, the quality of food is very high at Quince. In addition, I really like the small touches that shows many thought has gone into the restaurant. For example, each jug of water had a nice hint of citrus from the slices of colourful orange, lemon, and lime floating inside. The decorative fruit bowls had a couple of quinces sitting inside, perfuming the air with its distinctive floral fruity scent. For a neighbourhood bistro, Quince makes a strong case for repeated visits! Most of the events listed are either kids/family oriented (listen to ghost stories in a historic setting) or singles oriented (costume dance party). I think costume dance parties are fun and all, but I'm actually more interested in ghost stories. Although many of such stories are make-believes or heresay, it would still be somewhat educational to learn more about tales in my hometown. Perhaps I'll put together a schedule/itinerary to visit as many events as I can in some sort of ghoulish get-up (no Super Skater Girl this time). Speaking of educational, the Ontario Science Centre has a new exhibit Marvel Super Heroes Science Exhibition. This exhibition aims to explore the science of power within the world of Marvel Super Heroes with more than 30 interactive exhibits...how cool is that!!! In the evening of October 28, there's a Super Halloween Sleepover with exclusive access to this exhibition and the new IMAX film Wired to Win: Surviving the Tour de France. Holy cow, an evening of cycling AND super power. I am sooo tempted. I can certainly put my Super Skater Girl alter-ego to good use.